This website is so darn funny that it makes me giddy. 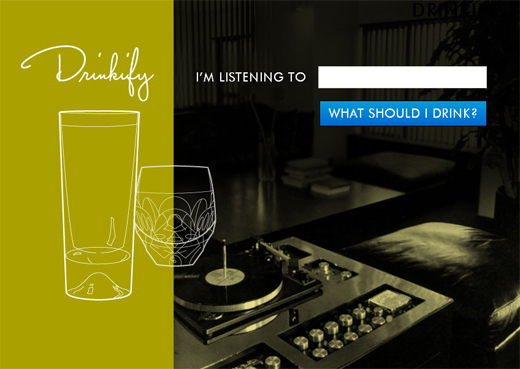 Drinkify is a wonderful website to figure out the appropriate alcoholic beverage to serve with the music that you’re listening to. Just the concept of it alone I love. I can hear the people who made it laughing in the background, or maybe at the bottom of the page where they explain that the website was created in “twenty-four boozy hours”. I love it. And you know, when it comes to combining the music with the booze, they’re right.